Subaru has issued a vehicle recall for their Outback and Legacy 2010 and 2011 models which may be a sign that this vehical is a defective product. The manufacturer is also recalling Tribeca SUVs from 2006 through 2012 and Forester SUVs from 2009 through 2012. According to Subary, the affected Tribecas and Foresters were sold before January of 2012. In the vehicle recall notice, the company stated that lights beneath the doors can overhead and start a fire. Moisture can pool in the puddle lights beneath the doors, which can then short-circuit and cause a fire. Subaru noted that 54,000 of their vehicles were equipped with this feature, but they will send notices to all model owners asking them to come in to have the lights repaired. According to the National Traffic Safety Administration’s (NTSA) website, the vehicle recall will begin in February. Subaru is offering the vehicles’ owners an additional fuse at no cost, to help solve the problem. Subaru notes that, fortunately, no crashes or fires have been reported because of this defect. They did notice the problem after a small number of reports that smoke was coming from that area of some models of their cars, and they immediately issued a vehicle recall notice. Vehicles are recalled nearly every week in the United States, and many consumers never hear about the problems associated with certain cars or trucks they might be interested in purchasing. Recalled vehicles that do not receive the proper maintenance can cause auto accidents or fatalities. While it is important to hold companies responsible for product safety, there are a few things consumers can do to help keep themselves safe. Staying up to date on vehicle recall information is very important. For a complete list of vehicle recall notices, visit the National Highway Transportation Safety Administration’s recall website. To protect yourself and your family, it’s important to know what products have been recalled because they are defective or unsafe. Federal agencies such as the FDA (Food and Drug Administration) and the CPSC (U.S. Consumer Product Safety Commission) frequently issue recalls for medical devices, drugs, and products that may be harmful to consumers. If you have experienced a problem with a defective product in your automobile, especially if a defective part has led to an auto accident or personal injury, and a proper vehicle recall notice has not been issued, you may be entitled to compensation. 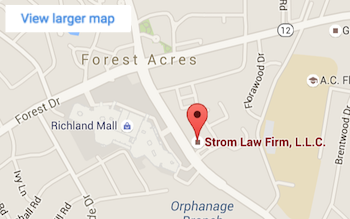 The attorneys at the Strom Law Firm can help. We can help you with complicated auto insurance claims, and make sure you receive the compensation you deserve to help you with lost income and medical bills. Our attorneys are licensed to practice in South Carolina, Georgia, and New York. We offer free, confidential consultations to discuss the facts of your case, so contact us today at (803) 252-4800.